You've found the “U.S. 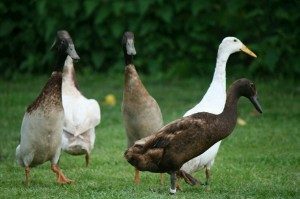 Indian Runner Duck Breeders” page here at Hobby Farm Wisdom! If this is the first time you have visited our site: Welcome! Indian Runners are a domestic breed that stand erect on their feet like penguins and run. They have a variety of colors which include Apricot Trout (Saxony), Black, Blue, Chocolate, Fawn, Fawn & White, Mallard, Silver, Trout and White. The ducks vary in weight between 3-5 lbs. Their height (from crown to tail tip) ranges from 20 inches in small females to about 30 inches in the taller males. Indian Runners are prolific egg layers that are happier spending most of their time foraging for food than being on water. The females usually lay about 150 – 200 eggs a year or more. Indian Runners originate from the East Indies and were used to clear the fields of pests since they run at a reasonable pace. They would be driven there in the mornings and rounded up again at night so that they could be kept safe from predators at night.